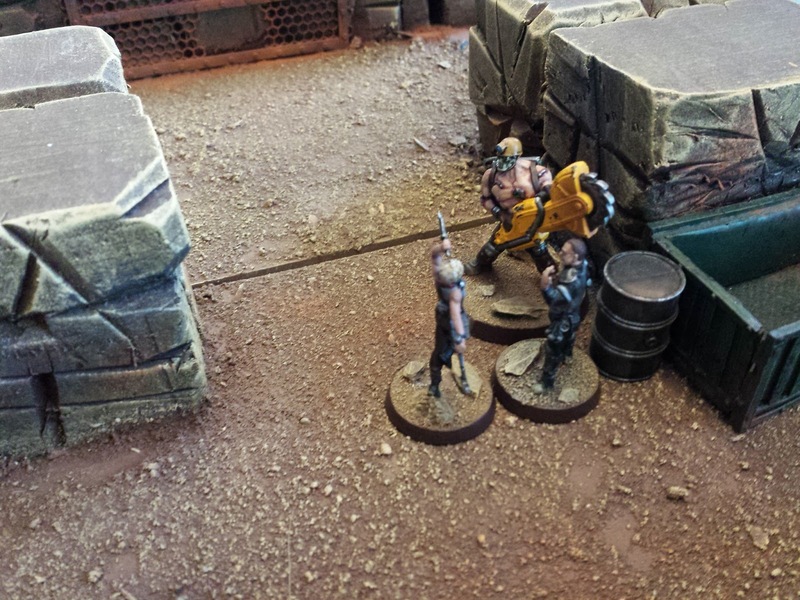 Mike and Aaron running demos at AdeptiCon2016! Being a former Chicago resident and only living an hour and a half away by car in my new home of Milwaukee, AdeptiCon, as the largest miniature wargaming event in the country, is a "must attend" event. The organizers and volunteer staff are hugely accommodating and are amazingly supportive of small companies. This year, as a special treat, two friends who I hadn't seen in a decade agreed to make the trek from Buffalo, NY and San Diego, CA respectively, to help me out and run demos. I'd like to share our history briefly. Back in the late 90's I worked for GW and Mike and Aaron were my co-workers. Less than a year after starting work at GW#108 in Buffalo, NY, I was promoted to manager and these two gentlemen were two of my most prized employees because of their passion for gaming and their understanding of the mission: to build the wargaming hobby. We all left GW#108 in 2001 and over the next few years we all went our separate ways as we moved around the world. We never fully lost contact because during our time at GW we formed a bond and social media like Facebook has kept us in touch. They've long been part of my sounding board as I've developed Broken Contract so when they made travel plans to come out and help at AdeptiCon I was ecstatic. After a game each of Broken Contract they were up and running demos and quickly did so confidently, executing demos better than my own. These guys are not just great friends, but true professionals and I can't thank them enough for all of their hard work over the weekend and their exceptional enthusiasm. My greatest lament is that we never got a picture of all three of us together. 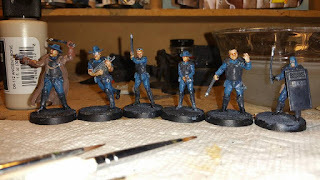 David Farr's Black Squadron Security force. 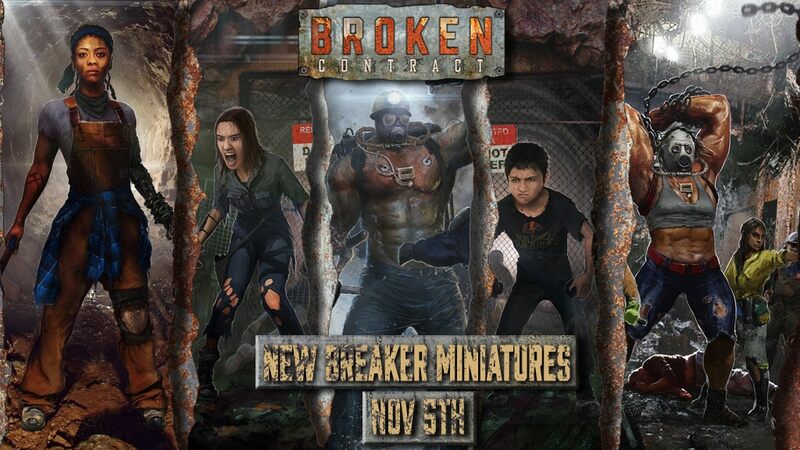 One of the highlights for me was having David Farr from the Nerdherders Podcast turn up with his full painted Broken Contract miniatures. We only played through the demo game with his minis so in hindsight I'm sad we didn't get in a larger game. Still, it was immensely exciting to see him bring out full forces of Black Squadron Security and Breakers. Hopefully we'll see more Broken Contract action from him in the future. 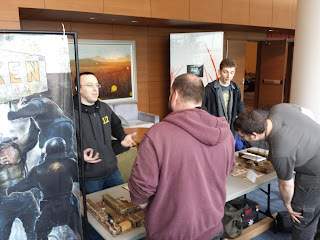 Another highlight was getting a brief interview from Dawn at Beasts of War as part of their AdeptiCon coverage. It doesn't contain a whole lot of info because I didn't know if follow up questions were coming, haha, but it's generated some interest so if you have any comments to share with the Beasts of War community hit up the comments below the video. Officer Hickley in a heap of trouble. 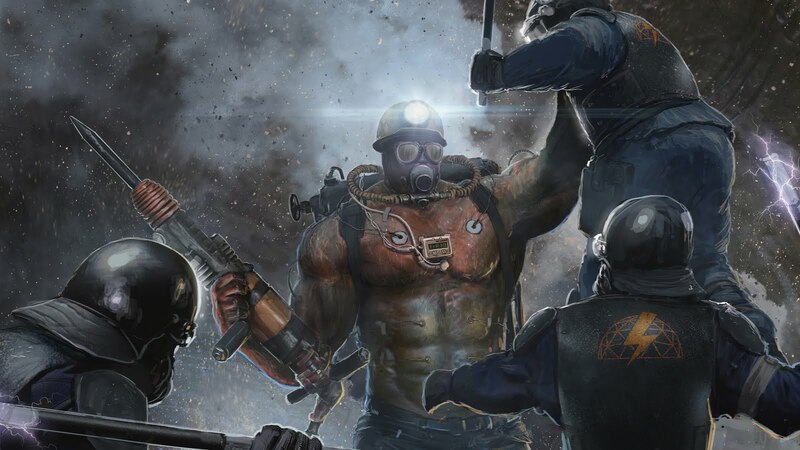 Finally, I want to take a moment to thank all of the people who took time out to go through a demo, discuss the game or the setting, compliment the models, and especially those of you who walked out the door with the rules and the background book. I cannot wait to hear your thoughts and see what kind of creative output you create as you explore Broken Contract. Don't be strangers. Get involved. Let's build something together! Thank you all for another great AdeptiCon and I hope we see you all again next year, if not before! Sounds like you had fun mate.